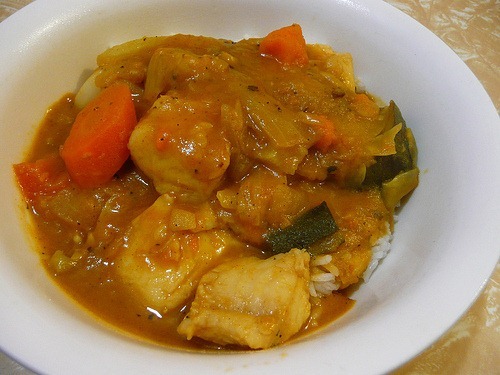 Thai Fish gravy is particularly high in omega-3 fatty acids that help protect against many diseases such as cancer, arthritis, high strokes and heart disease.Regular consumption of fish can reduce the risk of various diseases and disorders.children who eat fish may be less likely to develop asthma and many other diseases. So try to include fish in your meals. Take medium size fish and make slices. Apply salt, white pepper, black pepper, garlic ginger paste, corn flour and flour on fish. Add egg in this fish mixture. Heat oil and fry the fish on medium heat. In other pan take 2tbsp oil and sauté all vegetables, add salt and pepper, red chili, Worchester sauce and ketchup. Now add water and add corn flour dissolved in some water, cook till the gravy becomes thick. Now add green chilies and fried fish. Hey- great effort; I love the site:) A great idea especially for people living overseas with no access to the Pakistani cooking programs. Good going. Keep it up!!! Thanx for your appreciation and i hope that you will try these recipes and will share your experience with us. Next post: Fairness Creams: Do They Really Work?